Milford MI author interview of Kirt Manecke, author of Smile and Succeed for Teens, a book that enables to teens to learn valuable social skills in the face-to-face world they often know little about thanks to the onslaught of social media. I had a chance to interview Kirt to discuss his inspiration for the book and how his book can be used to promote social interaction amongst teens. Lisa LaGrou of Oakland County Moms: Where did you grow up and how long have you lived in Michigan? Smile and Succeed for Teens author, Kirt Manecke: I grew up in Farmington, MI, then Orchard Lake. I’ve lived in Michigan all my life (52 years) except for five years when I lived in Minnesota. Lisa LaGrou of Oakland County Moms: What inspired you to write a book about teens and people skills? Smile and Succeed for Teens author, Kirt Manecke: I had so many teachers and moms who read my first book, Smile: Sell More with Amazing Customer Service-The Essential 60-Minute Crash Course, and said, “Kirt, you’ve got to get this book in the schools. It’s all about the critical people skills these kids aren’t learning.” I decided to go a step further and, while basing Smile & Succeed for Teens www.SmileforTeens.com on my first book, customize it for teens. I added sections on interviewing and getting a job, overcoming stress, and volunteering. Plus, it includes fun, informative illustrations with educational captions. I spent nine months working with a focus group of teens, parents, grandparents and teachers. After reading the manuscript they offered feedback, one of the reasons Smile & Succeed for Teens is so inspiring to teens and that they are reading it. It’s a crash course in face-to-face communication so it’s quick, easy read. I even hired the teen editor at Penguin Books to ensure the book is teen friendly. With people skills among the top attributes businesses expect when interviewing and hiring, and with employers everywhere saying young people lack these skills critical to be successful at work, there’s a huge disconnect. I knew there was a need for this book. Smile & Succeed for Teens won the Mom’s Choice Gold Award honoring excellence. The book is helping middle school and high school age teens succeed in school, work, and life. Huron Valley Schools is using Smile & Succeed for Teens in one of their middle schools. A teaching guide will be available soon to make it easy for schools to reach more teens with this important information. Lisa LaGrou of Oakland County Moms: What other books have you written? What is Smile: Sell More with Amazing Customer Service about? 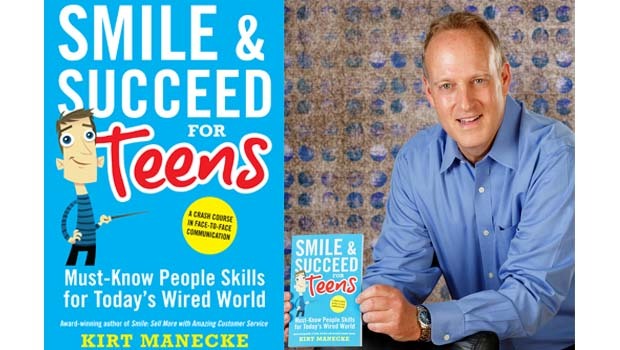 Smile and Succeed for Teens author, Kirt Manecke: Smile: Sell More with Amazing Customer Service is a 60-minute crash course in customer service and sales. Smile won eight awards and Neiman Marcus uses the book for training. Smile is featured in STORES magazine by the National Retail Federation. I wrote Smile because many businesses I visit are not providing a high level of customer service and are losing sales because of it. I wanted to provide businesses with a quick, easy way to train staff and immediately increase sales or donations. Smile: Sell More with Amazing Customer Service promotes and teaches the simple premise that good service is good business – that if you treat your customers well, you will be rewarded in return. Early in my career, I established, owned, and ran a highly successful award-winning specialty store. Fundamental to its success was a six-week employee training program that I created to guarantee outstanding customer service, ensure repeat business and positive word of mouth marketing, and maximize sales. The results were nothing short of amazing. In Smile, I’ve collected together powerful tips and techniques from this training program. I have a training guide available, and a teaching guide for schools. Hartland High School uses Smile in their DECA, school store, and business classes, and Lakeland High School uses Smile in their VEI class.